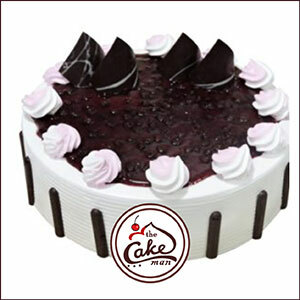 Black Forest Cake is the most famous and loved delicacy of all times. Kids love it and elders admire it. This is a perfect birthday cake and it can make your child very happy on their birthday. 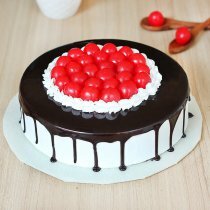 This cake is made up of soft chocolate sponge which is covered with layers of whipped cream along with yummy sour cherries. 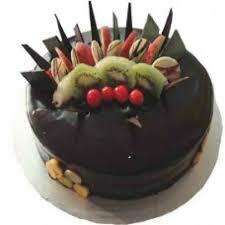 The Black Forest Cake is one of the loveliest dessert in the market now. Every bite of the cake can make you feel the lovely texture of the whipped cream and the soft chocolate will surely blow of your senses slowly. 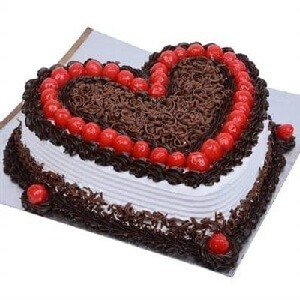 Black Forest Cake and Red Roses will be a perfect gift for occasions like anniversary, birthday, valentine’s day and many other sweet occasions. 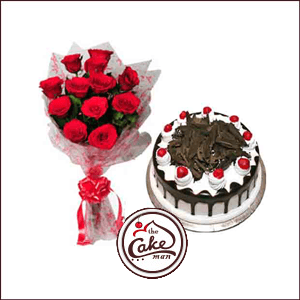 The Red Roses imply deep love and Black Forest Cake signifies your deep affection for your loved ones. All the red roses are finely packed in a white transparent paper with rose prints on it and the packaging is tied with a lovely red ribbon. The black forest cake with sour red cherries, tasty whipped creams and chocolate chips on the top of the cake compliments all the 12 red roses. Make your special day more special with this combo gift. Black Forest Cherry Cake is the invention of deliciousness. 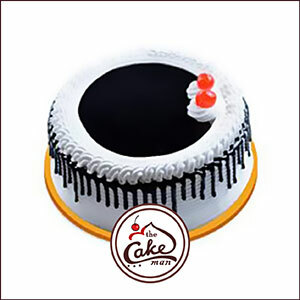 This cake consists several layers of chocolate sponge dipped in whipped cream and red cherries. The outer layer of the cake is iced with white frost and main attraction part of the cake is beautified with fresh sweet and sour red cherries. Have this lip-smacking dessert or gift this lovely dessert to your friends and families or present this dessert as an anniversary gift to your loved ones. 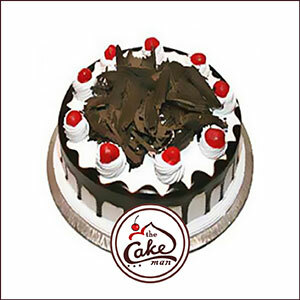 Enjoy the mouth-watering black forest cake which is a fusion of fresh cream and fragile chocolate chunks. This cake enhancing its features by having cherries on the top. Every piece of this cake will melt inside your mouth and it will gratify your taste buds. 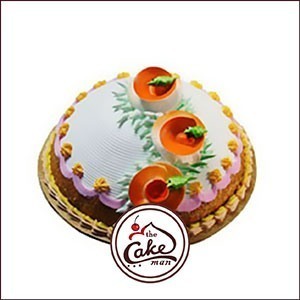 Simply order this enchanting cake from Thecakeman.in and gift it to your special person. 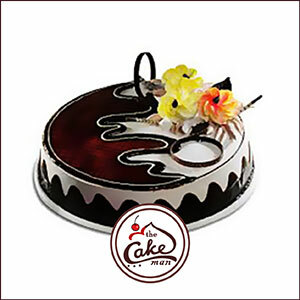 Black Forest Flower Cake is a unique blend of art and taste. 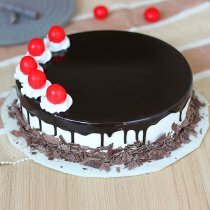 Black Forest cakes are in trend nowadays and its becoming quite common too. That’s why, our chef gave a trendy yet elegant look and taste to this common black forest cake and made it a new dessert. Whole cake is made up with whipped cream and frosted with layering of chocolate. The edible yellow flowers over the top is highlighting the cake more. 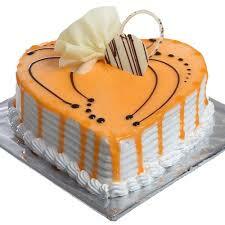 Gift this artistic cake to your special person on his/her anniversary day. Blueberry Cake is a mouth-watering cake for those who loves to taste unique flavors. This cake is an example of taste and good looks. This sweet cake is smooth and velvety in texture and each layer is iced with whipped cream mixed with the taste of blueberry. Top of the cake is designed with white frost along with chocolate strands and blueberries popping out. This delicacy can be a tangy party maker for a great anniversary party. Butter Scotch Cake is the perfect combination of smooth cream, melting caramel and butterscotch. The smooth buttery taste with twists of butterscotch crunches gives a beautiful taste experience. This creamy dome shaped dessert has various flavored layering and top of the cake has given a marvelous look with edible orange roses and green leaves. 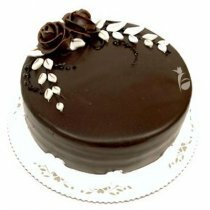 This highly presentable cake is a perfect token of love for your special one and suitable for a delightful anniversary day.